Frontier Has The TV Packages You Want. 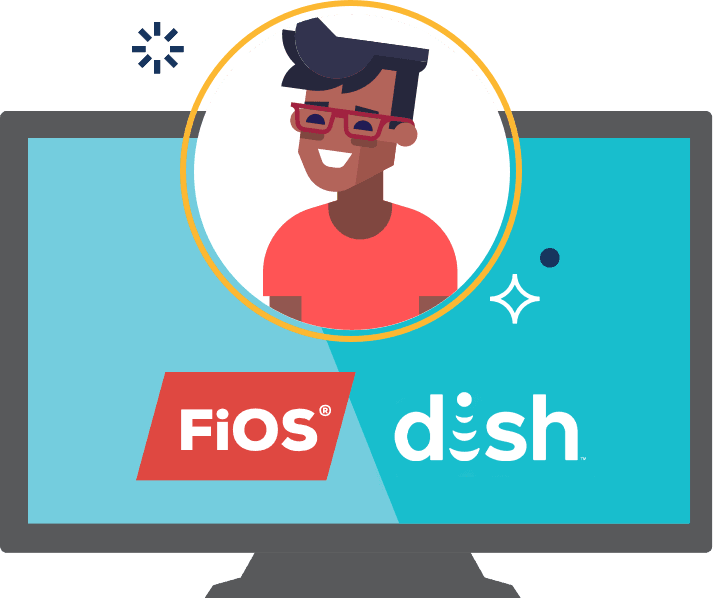 With FiOS® TV by Frontier®, you can get more than 400 channels including CNN®, ESPN®, the Discovery® Channel, the Disney® Channel, and more. You also get access to regional programming, so Frontier FiOS TV packages have something for everyone. All FiOS TV by Frontier packages also include HD channels, and access to over 150,000 On Demand titles. The next generation of entertainment is a DVR that lets you seamlessly control your TV entertainment in any room. Play, pause, and rewind to watch your favorite part again from the kitchen, the bedroom, or your favorite room in the house. Yes, there’s an app for FiOS TV by Frontier! Available on iOS and Android devices, the Frontier TV Everywhere app lets you watch your favorite shows on the go, manage your DVR settings, catch up on that On Demand movie you want to watch, and more. With DISH® TV, you can get TV packages with more than 290 channels, including AMC®, CNN®, the Disney® Channel, HGTV®, and many more. You also get access to regional programming, and can add on additional packages for more sports and movies, so there’s something for everyone. All DISH TV packages include HD channels, and access to DISH’s On Demand content library of over 20,000 full-length movies and shows. The DISH Hopper® 3 lets you record up to 16 shows at once, and gives you the ability to watch four different channels at the same time with the DISH Sports Bar functionality. If you want to be able to watch TV in other rooms, you can do so with the Joey™. Yes, there’s an app for DISH TV! Available on iOS, Android and Kindle Fire HDX, the DISH Anywhere app lets you watch live TV like sports and breaking news, recorded content, your DVR content and DISH’s On Demand library. You can also use the app to manage your DVR. See what TV packages are available in your area.